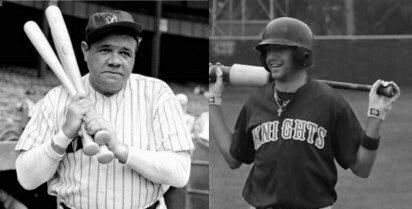 Shawn Rasmussen: Babe Ruth Reincarnate? Starting pitcher Shawn "Rassy" Rasmussen breaks the Knights' record for most strikeouts in a game (11Ks in 8 innings) previously shared by Ricky Caldecott, Frank Matteson, and Colton Smit who had 10Ks. Shawn also went 5-for-5 at the plate with 3 stolen bases to key a 4-3 extra-innings win over the scrappy Duluth Padres. Brett Schlosser knocks in the winning run with a 2-out double to the gap in right. During the post game interview when asked about what he attributed to his success during the game, Rassy, replied "I knew the team needed someone to put them on their backs. And I did a lot of push ups over the past week so I was really prepared."